Baby Carrots are not miniature or young carrots. They are adult carrots with imperfections that have been cut and peeled for commercial use. Their color and skin is often preserved by soaking them in chlorine water. The concept was developed to find a way to sell carrots that would otherwise be discarded. Baby Carrots are often enjoyed raw with dip, or added to stir fries and other cooked dishes. full-sized carrots that have been sliced and peeled to make carrot sticks of a uniform shape and size. Food complements: Ginger, Butter, Parsley, Dill, Fennel, Tarragon, Mint and nutmeg, As well as peas, Celery and zucchini. Choosing: Pick carrots that are deep orange in color. 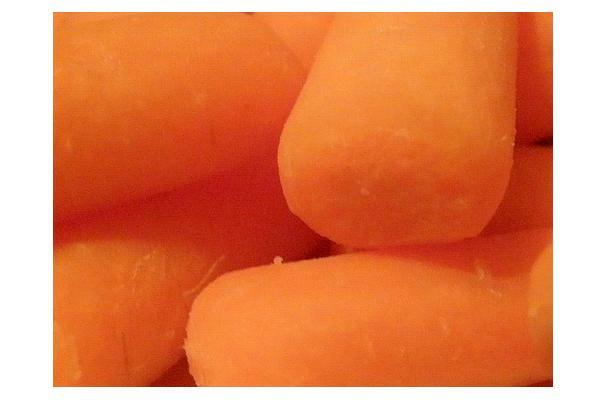 More beta carotene is present in carrots that have a darker orange color. Avoid carrots that are crackled, shriveled, soft, or wilted. Cook carrots in a small amount of water until they are tender, or save time and cook them in the microwave. Season with dill, tarragon, ginger, honey, brown sugar, parsley, lemon or orange juice. Cleaning: If baby carrots have what appears to be a light layer of white on them, this is simply indicative of the fact they are already peeled. Soak them in cold water for a time and they'll rejuvenate. During storage air can dry out the surface of carrots due to lack of humidity. The carrots may also shrivel due to the lack of moisture. Storing them in the refrigerator will preserve their flavor, texture, and the beta carotene content. Do not store them with fruits. Fruits produce ethylene gas as they ripen. This gas will decrease the storage life of the carrots as well as other vegetables. This is why it is best to store fruits and vegetables separately. History: Invented in the late 1980's by Mike Yurosek, a California farmer, as a way of making use of carrots which are too twisted or knobbly for sale as full-size carrots. Yurosek was unhappy at having to discard as much as 400 tonnes of carrots a day because of their imperfections, and looked for a way to reclaim what would otherwise be a waste product. He was able to find an industrial green bean cutter, which cut his carrots into 5 cm lengths, and by placing these lengths into an industrial potato peeler, he created the baby carrot.